From 2008 to 2010 the number of Ohio University police department liquor law arrests in on-campus residential areas increased, according to the 2011 Clery Act Compliance Report. 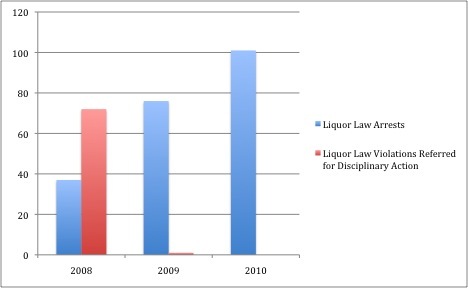 Despite that increase, liquor law violations referred for disciplinary action decreased. Between 2008 and 2010, the Ohio University Police Department arrests for liquor law violations increased while its referrals for disciplinary action for liquor law violations decreased. In 2008, the OUPD arrested 37 individuals for violations of the liquor law and referred 72 individuals for disciplinary action. The following year, arrests increased to 76 and referrals decreased to one. The police arrested 101 individuals, but made no referrals in 2010. Although arrests have increased, the total number if OUPD liquor arrests and referrals has remained similar, indicating a possible change in policy. The Cleary Act Compliance Report defines liquor law violations as “the violations of laws or ordinances prohibiting: the manufacture, sale, transporting, furnishing, possession of intoxicating liquor, maintaining unlawful drinking places; bootlegging; operating a still; furnishing liquor to a minor or intemperate person; using a vehicle for illegal transportation of liquor, drinking on a train or public conveyance; and all attempts to commit any of the aforementioned.” The report does not define liquor law violations referred for disciplinary action. Each year, colleges and universities that provide federal aid must compile and share its crime statistics according to the Jeanne Clery Disclosure of Campus Security Policy and Campus Crime Statistics Act and the Code of Federal Regulations (CFR).